At a time when the church needs a fresh encounter with Jesus, the hyper-grace message is lulling many to sleep. 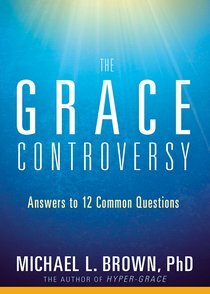 Authentic Grace carefully presents what the Bible says about grace, sin, and sanctification, and empowers readers to avoid compromise and live holy, victorious lives in Christ. Dr Michael L. Brown holds a Ph.D. in Near Eastern Languages and Literatures from New York University and has served as a visiting or adjunct professor at seven top seminaries. The author of more than twenty-five books, Brown also leads a ministry school that specializes in world missions and has preached and taught across America and around the world. He hosts the Line of Fire radio program, two hours daily and syndicated on several networks, as well as an apologetics TV program that airs on NRBTV. Michael has appeared often on secular and Christian media (including Piers Morgan, Tyra Banks, Phil Donahue, 700 Club, and Daystar) and has conducted debates or outreach lectures on major campuses, including Oxford University, the Hebrew University (Jerusalem), Ohio State University, Yale, and USC. Michael and his wife, Nancy, have two children and four grandchildren. They live near Charlotte, NC.